Pennsylvania State Police are treating a death in Greene Township, near Chambersburg, as a potential murder for hire. One of the two prime suspects is the victim’s stepdaughter. A crew of people repossessing an automobile at the victims home in the 3700 block of Mountain Shadow Circle on Thursday, Dec. 7 heard sounds of a struggle and called the police. The police arrived at 11:29 a.m.to find the body of 46-year-old Jamie Ruth Daley on the lawn outside. Daley had been stabbed several times and apparently beaten with a blunt object. Pennsylvania State Police Trooper Brent Miller spoke at a press conference at the scene Thursday evening. “It’s gruesome because it was a stabbing. You don’t hear stabbings really frequently,” said Miller. “At this time it’s mostly gunshots, or guns involved, but this one was strictly a knife and other objects. “That made the scene very gruesome, very bloody,” he said. The Major Case Unit, the Franklin County Coroner’s Office, and District Attorney’s Office investigated the case and on Friday, Dec. 8, charged two people with the crime. Tosha Mae Daley, 26, and Nicholas Vonallen Shinn, 21, were each charged with murder in the first degree, conspiracy to commit murder, burglary, robbery, theft, and conspiracy to commit burglary, robbery, and theft. Tosha Daley, Jamie Daley’s stepdaughter, was also charged with criminal solicitation of a murder and second-degree murder. By Thursday night police had zeroed in on Daley and Shinn. While they think the case is a murder-for-hire, each suspect told a different story of what had happened. Miller explained at a Friday press conference that as far as police can tell, Tosha Daley drove Shinn to the home and Shinn broke in and attacked Jamie Ruth Daley. Daley is claiming it was a simple burglary gone awry; Shinn is accusing Daley of paying him to kill her stepmother. 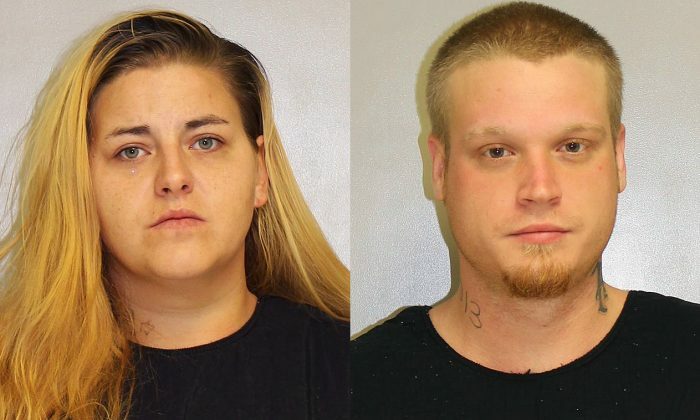 Both Daley and Shinn are being held in Franklin County jail without bail. Police say that Nicholas Shinn told a friend on the afternoon of Dec. 7 that he had attacked Jamie Daley, using a crowbar to “finish her off,” Public Opinion.com reported. That person’s tip to the police led to the arrests. Shinn allegedly told police, “I was going to get paid to whack her stepmom,” and that Tosha Daley had offered him $30,000 to commit the crime several times during the prior two weeks. Shinn claimed Daley had been arguing with her stepmother over a Jeep SUV, which was about to be repossessed. Also, Daley apparently learned that her stepmother had a sizeable life insurance policy. Shinn admitted to stabbing Jamie Daley and beating her with a chair. Shinn claimed that Daley picked him up after the murder, and the two drove to Greencastle where Shinn washed up and changed his clothes. Tosha Daley told a radically different tale. According to Daley, she drove Shinn to the development where her stepmother lived, dropped him off, and drove away. After leaving, she claimed she called her mother to warn her that Shinn might be coming to steal some money. Police. acting on information from witnesses, were able to identify the vehicle the couple used and tracked it to Greencastle. They recovered the bag full of bloody clothes and other evidence. If you enjoyed reading this article, your friends might, too. Share it with them.